Wide Eyed Editions, 9781847808707, 112pp. Explore skyscraper streets, museum miles, local food trucks and city parks of the United States of America and discover more than 2,000 facts that celebrate the people, culture, and diversity that have helped make America what it is today. From Anchorage to Washington D.C., take a trip through America’s well-loved cities with this unique A-Z like no other, lavishly illustrated and annotated with key cultural icons, from famous people and inventions to events, food and monuments. Gabrielle Balkan comes from a family of book-loving teachers and is passionate about literacy, education, and good stories—just as her people taught her to be. She's made good on her degree in education by working in children's publishing and related education fields for some 15 years. Gabrielle grew up across from the Indiana State Fair and now lives in Brooklyn. Illustrator Sol Linero lives and works in Buenos Aires, Argentina. Her clients include Scholastic, Oprah magazine, Jamie Oliver Magazine and Wired. 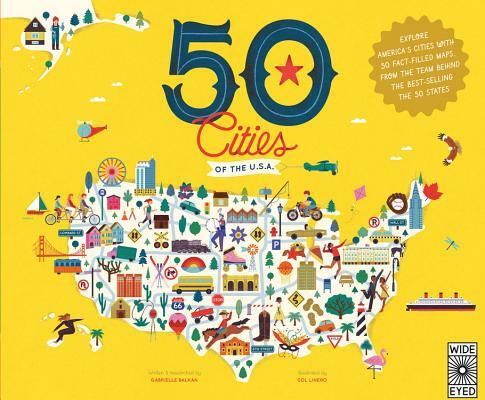 "Readers will learn plenty of trivia-worthy details about these cities"
"Middle graders studying the United States will find much intriguing information presented in a clever and inventive format. Highly Recommended"
"a trove of data nonetheless for tourists of both the active and armchair sorts." "This engaging volume contains a surprising amount of information in a brief amount of space. A “Cities We’d Also Love To Visit” section and an extensive index finish off the book. VERDICT Fun, fast trivia. While not intended for in-depth research, this is a highly entertaining delight for browsers." "From LA to Charleston, kids get to explore the entire country via this beautifully illustrated book. Author Gabrielle Balkan includes every facet of the cities she covers, including facts with an unexpectedly fun cultural bent (we love the Willie Nelson trivia on the Austin page) and a modern spin (city parks and food trucks get prominent mentions)." "Explorers, wanderlusters and geography buffs will spend hours poring over each page."